These standard terms and conditions apply to official Quotes for equipment or service. This page is provided for further reference to the terms included in a Quote. This quotation is valid for 30 days. RI's Terms and Conditions shall apply. Prices, Terms and Conditions are offered to you (the Customer) only and are not transferable. Changes to RI's Terms and Conditions must be approved in writing by Roos Instruments. Sales Taxes and/or Import Duties have not been included in any of the prices provided. You are required to provide Roos Instruments proof of exemption from CA state sales tax for the items purchased and/or provide Roos Instruments with shipping location information and applicable sales tax and/or duty information. You are responsible for all applicable import duties & taxes and will assist RI in obtaining an Export License if needed. FOB: Roos Instruments, Santa Clara CA. Payment Terms: Net 30. The Customer agrees to provide final acceptance of the system before sellable production parts are tested on the system and prior to shipment of these parts. The Customer agrees that full payment for each system will be received prior to shipment of additional systems. The Customer agrees that service contract begins after factory acceptance and installation at customer site. RI will consider any rescheduling which delays delivery of the Test System(s) by thirty (30) days or more a cancellation of the order and the Customer is liable for the Cancellation Fees listed above. "Proprietary Information" shall mean that information: (1) disclosed to or obtained by Roos Instruments from the Customer as a consequence of and as a term of this purchase agreement, and (2) which relates to the Customer's past, present and future research, development and business activities. The term "Proprietary Information" shall not mean any information which is previously known to Roos Instruments without obligation of confidence, or without breach of this agreement, is publicly disclosed either prior or subsequent to Roos Instruments' receipt of such information, or is rightfully received by Roos Instruments from a third party without obligation of confidence. For a period of two (2) years from the date of disclosure, Roos Instruments agrees to hold all such Proprietary Information in trust and confidence for the Customer and not use such Proprietary Information other than for the benefit of the Customer. Except as may be authorized by the Customer in writing, for such period of time, Roos Instruments agrees not to disclose any such Proprietary Information, by publication or otherwise, to any other person or third party. At the conclusion of the two (2) year period, Roos Instruments will return to the Customer or certify the destruction of all written or descriptive matter, including but not limited to drawings, blueprints, descriptions, or other papers, documents, tapes, or any other media which contains any such Proprietary Information. In the event of a loss of any item containing such Proprietary Information, Roos Instruments shall promptly notify the Customer in writing. The following terms and conditions govern the license of the Software (defined below) by Roos Instruments, Inc. ("Licensor") to the party ("Licensee") identified in the Sales Contract between the parties ("Sales Contract"). Software. "Software" means the software in object and/or source code and (i) all updates and enhancements for such software provided by Licensor to Licensee, and (ii) any modifications, improvements or derivative works based on such software created by or on behalf of Licensee. a) Documentation. "Documentation" means any printed material provided with the Software. b) License. "License" means the license to use the Software for Licensee's internal purposes. The License is granted pursuant to the provisions of this Agreement. c) Workstation. "Workstation" means a single microcomputer, personal computer, computer terminal, or network station. 1.1 Grant of License. Subject to Licensee's compliance with this Agreement, Licensor grants to Licensee, and Licensee accepts, a nonexclusive License to use the Software solely at the site identified in the Sales Contract (the "Site"). No other rights are granted to the Licensee hereunder, except as are expressly stated in this Agreement. Licensee has the rights of a licensee only. Licensor retains title to the Software and Documentation and any copies thereof, and any and all intellectual property rights therein or related thereto, including the originals provided with this Agreement. 1.2. Term of License. The License granted to Licensee by this Agreement shall last for the duration of the copyright of the Software, unless earlier terminated by Licensor pursuant to this Agreement. Upon termination of the License, Licensee will return to Licensor the Software (or, in the alternative, provide Licensor with written verification that all copies of the Software at the Site have been destroyed) and the Documentation and any hard copies thereof. 1.3 Copies. Licensee may not copy the Software except as necessary to use the Software at the Site or to modify, improve or create derivative works based on the Software at the Site. Such necessary use means copying the Software to the internal hard disk of Workstations at the Site, copying the Software to network file server at the Site in order to make the Software available for use on Workstations at the Site, and creating backup diskettes or backup tapes. All trademark and copyright notices must be included and unaltered on any copies made. 2.1. Location. Licensee is authorized to use the Software only at the Site. Use of the Software at any other location is prohibited. 2.2 Tool: Licensee is authorized to use the Software only for the Tool to which it is assigned. 2.3. Modification. Licensee may modify and improve the Software and create derivative works based on the Software and the Documentation; provided, however, that Licensor shall own all rights (including, without limitation, all intellectual property rights) in and to any such modifications, improvements or derivative works. Licensee shall notify Licensor within 20 days after the date any such modification, improvement or derivative work has been created. Licensee hereby assigns, and shall cause its employees and independent contractors to it to assign, to Licensor all rights (including, without limitation, all intellectual property rights) in any such modifications, improvements or derivative works. Licensee shall do all other lawful acts, including the execution of documents and lawful oaths and the giving of testimony, that in the opinion of Licensor, its successors and assigns, may be necessary or desirable for perfecting, affirming, maintaining and recording Licensor's complete ownership and title to any such modifications, improvements or derivative works (including, without limitation, all intellectual property rights). Any such modifications, improvements and derivative works shall become part of the Software and be subject to all terms of this License (other than Licensor's limited warranty). 2.4. Assignment. Licensee shall not transfer, assign, or sublicense, whether by operation of law or otherwise, the rights granted by this License to any third party for any reason. Any attempted transfer, assignment, or sublicense in violation hereof shall be void. 2.5. Confidentiality. Licensee shall not disclose any trade secrets or confidential information learned as a result of use of the Software, or the Software or the Documentation themselves, to any third party for any reason. Such restriction shall extend to any and all of Licensee's employees who use or have knowledge of the Software. Licensee agrees that such restriction shall survive any termination of the License by Licensor or otherwise. 2.6. Limits On Use. Licensee shall not use the Software as part of a commercial time-sharing or service bureau operation, in any other resale capacity, or in connection with offering services to any third party. 2.7. Termination. Licensee's breach of any provision of this Agreement shall constitute a basis for termination of the License and this Agreement by Licensor at any time by notice to Licensee. In addition, Licensor shall have the right to terminate this Agreement by notice to Licensee if Licensee (i) terminates or suspends business or (ii) merges with, or is acquired by, another entity or (iii) becomes insolvent, makes an assignment for the benefit of creditors, suffers or permits the appointment of a receiver, trustee in bankruptcy, or similar official for any substantial part of its business or assets, or avails itself of any bankruptcy relief under the Federal Bankruptcy Code or any other Statute or procedure relating to insolvency or the protection of the rights of creditors. 3. LIMITED WARRANTY AND LIMITED LIABILITY. 3.1. Limited Warranty. 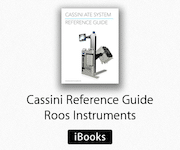 [Roos Instruments warrants its software products designated by RI for use with a hardware product, that when properly installed, will not fail to execute their programming instructions due to materials and workmanship for 90 days. If RI receives notice of such defects during the warranty period, RI will, at its option, repair or replace the defective software media. RI does not warrant that operation of software or hardware will be uninterrupted or error free.]. EXCEPT FOR THE FOREGOING LIMITED WARRANTY, LICENSOR MAKES NO WARRANTY OR REPRESENTATION RELATING TO THE SOFTWARE, THE DOCUMENTATION, OR THIS AGREEMENT, AND LICENSOR DISCLAIMS AND EXCLUDES ANY AND ALL IMPLIED WARRANTIES OF MERCHANTABILITY OR FITNESS FOR A PARTICULAR PURPOSE. LICENSOR DOES NOT WARRANT THAT THE SOFTWARE WILL MEET LICENSEE'S REQUIREMENTS OR THAT THE SOFTWARE IS WITHOUT DEFECT OR ERROR. NOTWITHSTANDING ANY OTHER PROVISION OF THIS LICENSE, LICENSOR MAKES NO WARRANTY OR REPRESENTATION RELATING TO ANY MODIFICATIONS, IMPROVEMENTS OR DERIVATIVE WORKS BASED ON THE SOFTWARE CREATED BY OR ON BEHALF OF THE LICENSEE. 3.2. Limited Liability. LICENSOR SHALL NOT BE LIABLE FOR SPECIAL, INCIDENTAL, CONSEQUENTIAL, INDIRECT, OR PUNITIVE DAMAGES, EVEN IF LICENSOR HAS BEEN ADVISED OF THE POSSIBILITY OF SUCH DAMAGES. Licensor is not responsible for any costs incurred as a result of the use of the Software, including but not limited to, lost profits or revenue, loss of data, costs of re-creating data, the cost of any substitute equipment or program, or claims by any third party. LICENSOR'S AGGREGATE LIABILITY ARISING FROM OR RELATING TO THIS AGREEMENT OR THE SOFTWARE OR DOCUMENTATION IS LIMITED TO THE LICENSE FEE FOR THE LICENSE. 4. INCORPORATION BY REFERENCE. This Agreement incorporates by reference all terms of the Sales Contract. In the event of conflict between the terms of this License and of the Sales Contract, this License shall govern. Subject to the terms and conditions of this Agreement, RI hereby grants to Licensee, a non-exclusive, nontransferable, royalty-free license, to use the Drawings solely for the purpose of enabling Licensee or its authorized subcontractors to manufacture components and/or replacement parts for the Devices which are purchased and used by Licensee. Apart from the license rights set forth in Section 1.1, above, RI grants and Licensee receives no license rights nor any ownership right, title or interest nor any security interest or other interest in any intellectual property rights relating to the Drawings, nor in any copy of any part of them. RI will retain all right, title and interest, including all intellectual property rights and proprietary rights, in and to the Drawings. To the extent that Licensee or its independent contractors create any work or materials based on the Drawings and in which they claim any proprietary or intellectual property rights, Licensee assigns to RI all right, title, and interest now existing or that may exist in the future in and to any such work or materials created by Licensee or its independent contractors. The foregoing rights include, but are not limited to, all rights to register, or to renew any intellectual property rights in the work, and all causes of action related to such intellectual property rights, including the right to sue for past damages. RI and Licensee each warrant and represent that it is authorized to enter into and perform this Agreement. Each of RI and Licensor will indemnify and hold harmless each other, its parents and subsidiaries, and any of their respective officers, directors, employees and shareholders from and against any claims, demands, suits, causes of action, losses, damages, judgments, costs and expenses (including reasonable attorneys' fees) arising out of any breach of the indemnifying party's warranty, set forth in Section 3.1, above; provided that the indemnifying party will provide prompt written notice of such claims to the indemnified party and the indemnified party will have the right to control the defense and settle of such claims. The indemnifying party will cooperate with and provide reasonable assistance to the indemnified party in connection with its obligation to indemnify set forth in this Section 3.2. The term of this Agreement will commence on the Effective Date and will continue until this Agreement is terminated pursuant to this Article 4. RI may terminate this Agreement without cause upon not less than 60 days' written notice to Licensee. RI may terminate this Agreement and cancel the license granted under this Agreement at any time in the event that Licensee is in material default or breach of any material provision of this Agreement, and such default or breach continues without remedy for a period of 30 days after written notice thereof. In the event that a default or breach is reasonably incapable of cure within such 30- day period and Licensee is using all reasonable efforts to cure such default or breach, the cure period will continue for an additional 30 days. Upon termination of this Agreement for any reason, Licensee immediately will return or provide to RI all Confidential Information and tangible items in Licensee's possession or control which are proprietary to RI. Licensee acknowledges and agrees that the Drawings and any other information provided to Licensee by RI under this Agreement (which other information is marked as "proprietary" or "confidential" or, if disclosed orally, is reduced to writing and similarly marked and delivered to Licensee) ("Confidential Information") constitute the confidential and proprietary information of RI, and that Licensee's protection of Confidential Information is essential to this Agreement and is a condition to Licensee's use and possession of the Drawings. Licensee will retain all Confidential Information in strict confidence and not disclose it to any third party (except as authorized by this Agreement) or use it in any way except as permitted by this Agreement without RI's express written consent. The prohibitions contained in this Section 5.1 preclude dissemination of such information to Licensee's subsidiaries or affiliates, except if such subsidiary or affiliate becomes an assignee of this Agreement as set forth in Section 6.1, below. Specifically, without limitation, Licensee acknowledges and agrees that the Drawings will only be used in conjunction with the use of the Devices. 5.2.3 becomes known to Licensee, without restriction, from a source other than Licensee, without breach of this Agreement by Licensee and otherwise not in violation of RI's rights; or 5.2.4 is required to be disclosed pursuant to law, regulation, or court order provided, however, that Licensee gives RI prompt, written notice in order to allow RI to take whatever action it deems necessary to protect its Confidential Information. Without limiting the foregoing, prior to any independent contractor's gaining access to any of RI's Confidential Information, such independent contractor will enter into a confidentiality agreement with Licensee on the same terms and conditions as those in Section 5.1, above. Further, Licensee will require all of its independent contractors to assign to Licensee all right, title and interest in any work or materials created by such independent contractor and based on the Drawings and in which Licensee or independent contractor claims any proprietary or intellectual property rights. Licensee will be fully responsible for the authorized conduct of all its employees, agents and representatives who may in any way breach this Agreement. Licensee recognizes and acknowledges that the Confidential Information may have competitive value and that irreparable damage may result to RI if Licensee improperly discloses Confidential Information to any non-authorized third party. Licensee may not assign this Agreement or any rights or obligation hereunder, directly or indirectly, by operation of law or otherwise, without the prior written consent of RI. Any such attempted assignment will be void. Notwithstanding the foregoing, Licensee may assign this Agreement to a successor to all or substantially all of its business or assets to which this Agreement relates, and Licensee will have the right to transfer its rights hereunder to any company which is wholly owned by Licensee; provided that, such successor or wholly owned subsidiary agrees in writing to be bound by all the terms and conditions of this Agreement that are applicable to Licensee. Any notices or other communications required to be given pursuant to this Agreement will be in writing and will be effective upon delivery by hand or upon receipt if sent by mail (registered or certified mail, postage prepaid, return receipt requested) or by express mail or overnight courier or upon transmission if sent by telex or facsimile (with request for confirmation of receipt in a manner customary for communications of such respective type), except that if notice is received by email or facsimile after 5:00 P.M. on a business day at the place of receipt, it will be effective as of the following business day. Notices will be delivered to the addresses set forth in the agreement. Any party may change its address for receiving notice by written notice given to the other party in the manner provided above. In all respects, including all matters of construction, validity and performance, this Agreement and the obligations set forth hereunder will be governed by, and construed and enforced in accordance with, the laws of the State of California applicable to contracts made and performed in such State, without regard to the principles thereof regarding conflict of laws, and any applicable laws of the United States of America. Except as otherwise provided in this Agreement, and to the extent permitted by law, the parties hereto agree that all actions or proceedings arising in connection with this Agreement, will be tried and litigated only in the state and federal courts located in the County of Santa Clara, State of California. The parties, to the extent they may legally do so, waive any right each may have to assert the doctrine of forum non conveniens or to object to venue to the extent any proceeding is brought in accordance with this Section 6.3 and stipulate that the state and federal courts located in the County of Santa Clara, State of California will have in personam jurisdiction and venue over such party for the purpose of litigating any such dispute, controversy, or proceeding arising out of related to this Agreement. If any term or provision of this Agreement will be found to be void or contrary to law, such term or provision will, but only to the extent necessary to bring this Agreement within the requirements of law, be deemed to be severable from the other terms and provisions hereof, and the remainder of this Agreement will be given effect as if the parties had not included the severed term herein. The provisions of Articles 2, 3, and 5 will survive the termination of this Agreement. The waiver of, or failure to enforce, any breach or default hereunder will not constitute the waiver of any other or subsequent breach or default. The section and other headings contained in this Agreement are for reference purposes only and will not affect any way the meaning or interpretation of this Agreement. This Agreement sets forth the entire Agreement between the parties and supersedes any and all prior proposals, agreements and representations between them, whether written or oral. This Agreement may be changed only by mutual agreement of the parties in writing. RI warrants, with respect to goods manufactured solely to RI's designs and specifications, that there is no infringement on any patent(s), copyright(s) or trademark(s), or misappropriation of any trade secret(s), or unfair competition. RI will have no obligation to indemnify Buyer or Buyer Personnel for claims that RI's Deliverables or Services infringe on the intellectual property rights of a third party to the extent such claims arise as a result of: (i) Buyer's combination of Deliverables or services with other products or services not foreseeable by RI, (ii) RI's implementation of a design originated solely by Buyer or, (iii) Buyer's modifications of the Deliverables except for intended modifications required for use of the Deliverables. RI will maintain at its expense (i) comprehensive general or public liability insurance with a minimum limit per occurrence or accident of $1,000,000, (ii) workers' compensation or employer's liability as required by applicable statute but not less than $1,000,000. At Buyer's request, Buyer will be named as additional insured with respects to Buyer's insurable interest. Neither party will be in default or liable for any delay or failure to comply with these Terms and Conditions due to any cause beyond the control of the affected party due to labor disputes, war, riot, civil commotion, acts of the public enemy, fire, flood or other acts of God or causes beyond the reasonable control of such party. The period for performance for the party affected by such a cause shall be extended by the duration of the condition. In the event that any dispute arises between the two parties with respect to any of the provisions of these Terms and Conditions of Purchase, such a dispute, if not settled by negotiations between the two parties within a reasonable time, shall be subject to mediation. If the dispute cannot be settled through mediation, then it will be settled by arbitration in accordance with the prevailing rules of the American Arbitration Association. The laws of the State of California applicable to contracts executed and performed within that state will apply. Judgment of the arbitrator shall be final and binding. Each party waives its rights to an appeal and/or a jury trial. The validity, performance and construction of these Terms and Conditions and any sale made hereunder shall be governed by the laws of the State of California as applied to contracts made and to be performed entirely in California. RI represents that with respect to the production the articles and/or the performance of services covered by this purchase order, it will fully comply with all requirements of the Fair Labor Standards Act of 1938 as amended. Any changes to our Standard Terms & Conditions will be posted to this page.